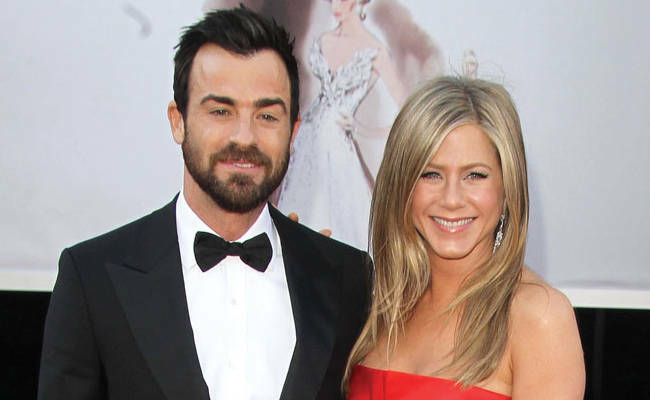 Jennifer Aniston chose her scarlet Valentino dress to wear to the Oscars because it was easy to go to the toilet in. Jennifer Aniston chose her Oscars dress because it was easy to go to the toilet in. The 44-year-old actress wowed in her scarlet gown at the prestigious ceremony at Hollywood's Dolby Theatre on Sunday evening (February 24, 2013), which she attended with her fiance Justin Theroux, and revealed her decision to wear the Valentino dress was down to convenience more than style. She joked: "It fits, it's comfortable, and it's easy to pee in. You just lift, hoist and do a couple squats!" After being prompted by Justin, 41, to comment on the colour of the piece, the former Friends star added to People magazine: "It's Valentino red. Yes, Valentino red! I just loved the color." While Jennifer seemed to have chosen her gown rather easily, other actresses took more time and deliberation over their outfit for the event. Jennifer Hudson—who won Best Supporting Actress at the Academy Awards in 2007 for her role in Dreamgirls and also performed at this year's ceremony—opted for a sparkling blue Roberto Cavalli piece with a high-slit on Sunday, but admitted it took several days to come to a final decision. She joked before the ceremony: "It took three days of fittings, three hours each day to make my decision. It's a serious decision. My stylist cried tears of joy [when I finally decided]."